Product: Mashers Era 120ml Miniature Square Disposable Plastic Dessert Cups Party Bowls – Packs of 50 was added to cart. Looking for stylish disposable tableware for an upcoming party or event? 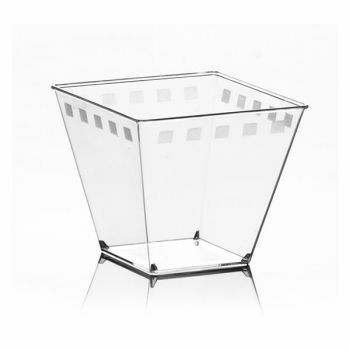 Look no further than these fabulous 120ml Mini Square Clear Plastic Disposable Dessert Bowls from Mashers Era Collection. Perfect for serving up tasty morsels, tiny desserts, and dipping sauces, they are made from durable food grad plastic, designed to hold up to 120ml, and beautifully finished with a geometric print that will elevate any table setting. Washable and reusable, these Mini Disposable Party Bowls are a great investment for wedding receptions, garden parties, and corporate cocktail functions.